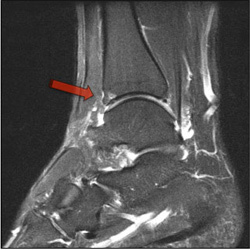 Ankle instability after traumatic sprains is a very common condition. After excluding an associated fracture with an X-ray the initial treatment of a sprained ankle involves support of the ankle in a CAM boot and/or ASO lace up ankle brace combined with a physiotherapist led ankle rehabilitation program. With this approach 9 in 10 patients after their first bad ankle sprain will do well. Unfortunately, however, 1 in 10 patients will experience further instability symptoms or persistent ankle pain. 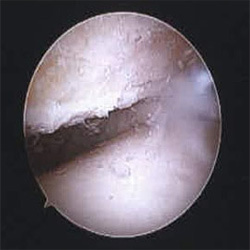 At this point referral to our clinic is appropriate for consideration of ankle stabilization surgery. Usually our surgeons will arrange for an MRI scan of the ankle prior to determining the best surgical procedure for the problematic ankle. 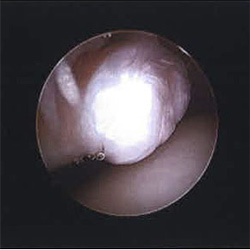 Frequently the MRI scan will identify problems such as cartilage and peroneal tendon injuries that also need to be addressed at the time of ligament reconstruction surgery. 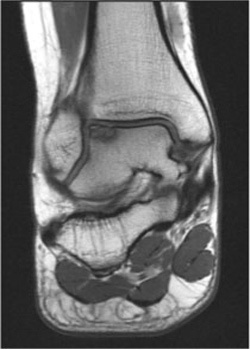 Following the MRI, the patient noted above had ongoing symptoms and underwent ankle arthroscopy. This is the view of the ankle joint during arthroscopy showing normal cartilage and bare bone where the cartilage was damaged (OCD). 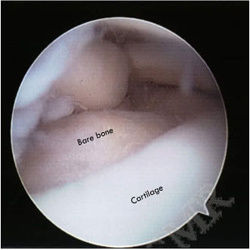 Removing any loose pieces of cartilage and smoothing out the damaged areas of bone or cartilage are usually effective in relieving symptoms.